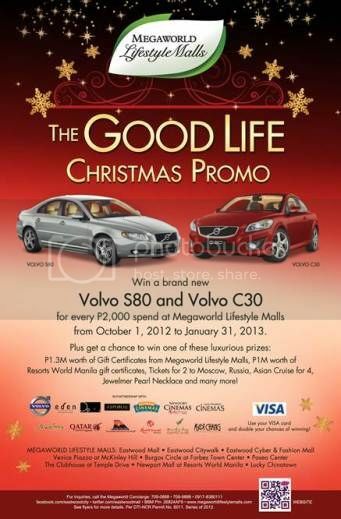 Join Megaworld Lifestyle Malls’ The Good Life Christmas Promo! Would you like to win 1.3M worth of gift certificates from Megaworld Lifestyle Malls? Well, you can get this plus other luxurious prizes if you will join The Good Life Christmas Promo! You can win exciting shopping gifts and deluxe holiday packages by simply spending Php2,000 in single or accumulated receipts at any Megaworld Lifestyle Malls establishments from October 2012 to January 2013. You can even double your chances of winning when you use your Visa Card in paying for your purchases. The following prizes are at stake: a brand new Volvo S80 and Volvo C30; 1.3M worth of gift certificates from Megaworld Lifestyle Malls; 1M worth of Resorts World Manila gift certificates; tickets for 2 to Moscow, Russia; Asian Cruise for 4, Jewelmer Pearl Necklace and many more! So what are you waiting for? Shop and dine now at these Megaworld Lifestyle Malls: Eastwood Mall, Eastwood City Walk, Eastwood Cyber & Fashion Mall, Lucky Chinatown, Newport Mall at Resorts World Manila, Burgos Circle at Forbes Town Center, The Clubhouse at Temple Drive, Paseo Center Makati and Venice Piazza at McKinley Hill. Monthly raffle draws begin on October 29, 2012, and the grand raffle draw is on February 5, 2013. This entry was posted in Megaworld Lifestyle Malls, The Good Life Christmas Promo. Bookmark the permalink. 2 Responses to Join Megaworld Lifestyle Malls’ The Good Life Christmas Promo! a promo that would let you win a car! That’s my kind of promo! a volvo as a prize, ooh i so love to join and win. But too bad we are miles away from the megaworld.